Illinois bedrock map Geological columns show the relationship of various rocks. Geologists prepare maps of what the rocks would look like at the surface, if all the surface material was removed. When you color in your bedrock map of Illinois, use a different color for each age of rock and color in the key and your geological column to match. Click on the small map of Illinois to go to a large version which has both "top of rocks" as well as a column key. A more detailed bedrock map of northern Illinois shows the region in greater detail. Click on the picture of the Illinois Stratigraphic Column to go to a larger version which has been annotated to correspond with localities mentioned in the following text. Geological columns are only approximations of reality. Some attempt to show all the possible rocks in a given area; others try to show just the formations which remain. This diagram is of the latter type. No full geologic column is ever exposed to view. Parts may be filled in by studying rocks brought up during excavation or drilling. It is possible to do all the things on this page in one day. The pictures were taken between 1993 and 2001. Chicago is built upon a vast Silurian Reef. 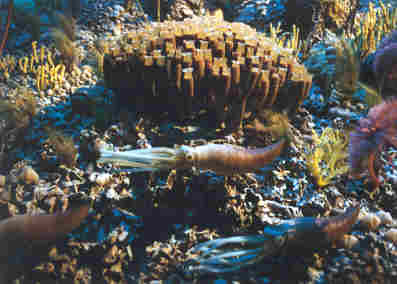 These pictures are of a diorama at the Milwaukee Public Museum of plants and animals which lived on and formed Silurian-age reefs. Fossil crinoids, brachiopods, trilobites, ammonoids, gastropods and corals are found in Thornton Quarry rock. 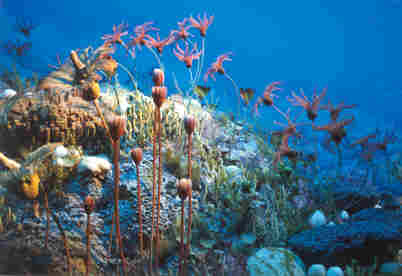 Modern reef environments are found in warm, shallow oceans. The water is usually clear of silt or even wind-blown sediments. Many of the reef inhabitants are filter feeders and sediment prevents feeding. The area which we call the Chicago Region is itself part of a larger geologic region, regionally known as the Niagaran Escarpment, marked by outcrops of Silurian dolomites and limestones. Niagara Falls cuts through this rock which is exposed in a giant ring around the middle three Great Lakes and centered on the state of Michigan. The silver-grey to white dolomite pebbles found in builder's piles and as landscaping stones may come from local quarries. Thornton Quarry rock is uniquely recognizable by black flecks of asphalt mixed in with highly fossilferous reef rock. Thornton Quarry rocks kept half (or less) submerged in household vinegar produce pink dolomite crystals. "At Thornton... there is a low elevation of limestone covering an area of 1.5 to 2 square miles. The village [of Thornton] is on the southeastern part of the elevation. The rock has a relief of 10 to 18 feet above the plain to the north, and is but thinly covered by drift. About one-half mile north of the village, on the road to Blue Island, the rock is exposed with a dip of 20 degrees northeast. In the southwestern part of the village is the quarry of the Brownwell Improvement Company. The strata have here a dip of 12 degrees southeast, and the upturned edges have been smoothed and striated by glacial action." "The quarry shows at present a 95-foot section. The beds increase in thickness downward from about 4 inches to 4 feet and are much fractured, so that no dimension stone is obtained. Near the surface the rock is buff and somewhat shaly, passing downward into a dense, blue gray, siliceous limestone. Mr. Brownwell states that the rock contains much bitumen or asphalt in pores and small cavities, and it also highly fossiliferous. In the bed of Thorn Creek, just south of the village bridge, the rock has a dip of about 24 degrees north-northeast. About 100 yards to the south the dip is in the opposite direction, toward the southwest, at a like angle, indicating a gentle local anticline. At this place the glacial striations are well shown." Click on the map to go to the 1902 Chicago Folio map of the Thornton area. "A good observer at a good exposure notes also that the dome has a core... that the color of the core differs a little from that of the [dipping] stratified rock, that the core rock is highly fossiliferous and is full of cavities from which ooze little driblets of asphaltum on hot summer days... A representative collection of fossils from the ... core... shows a preponderance of sessile and non-swimming forms -- corals occur in profusion, bivalve shells are very abundant, coiled shells are common. In the adjacent flat-lying strata there are far fewer fossils, but the free-traveling forms -- floating, swimming, crawling -- occur in a considerably higher percentage compared with the ... [residents of] the dome cores." "As the quarrying has been pushed southward, farther from the large [reef] structures, the number of exposed baby reefs has decreased. The little reefs are certainly related in some way to the main structure. They seem to be small colonies which grew up like suburban villages about a metropolis." Click on the map to go to a larger map of Thornton Quarry. 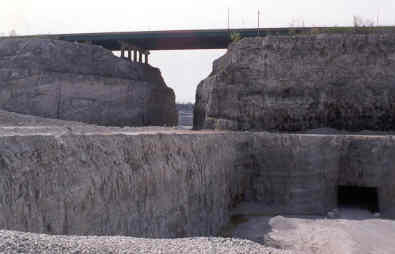 Thornton Quarry is part of vast Silurian age deposits collectively known as the Niagaran formation or Niagara limestone. It outcrops from northeastern Illinois around the great lakes and is exposed in Niagara Falls. It represents a time when what is now Chicago was the floor of a warm, shallow ocean. Something, however, caused cracks in the reef -- perhaps slumping of unstable reef carbonates. These cracks filled in with some of the only Devonian age material in the Chicago region -- a clay which bears pyrite and the occasional shark's tooth! Unfortunately, these cracks are mostly mined out or too close to the highwall of the quarry for fossil collecting. Material Service Corporation has built an overlook of Thornton Quarry rock which contains some fine specimens of fossils in the walls. There is an instructional audio message and a great view into the quarry. The overlook can be accessed by contacting Material Service Corporation. "...characterized by the presence of large reefs, some of which grew to heights of 100 feet or more above the surrounding sea floor... The dolomite in the reefs is exceptionally pure, containing only traces of [mud]... and rare, isolated sand grains... [it also] contains no chert... Because it has a low iron content, it weathers grey." 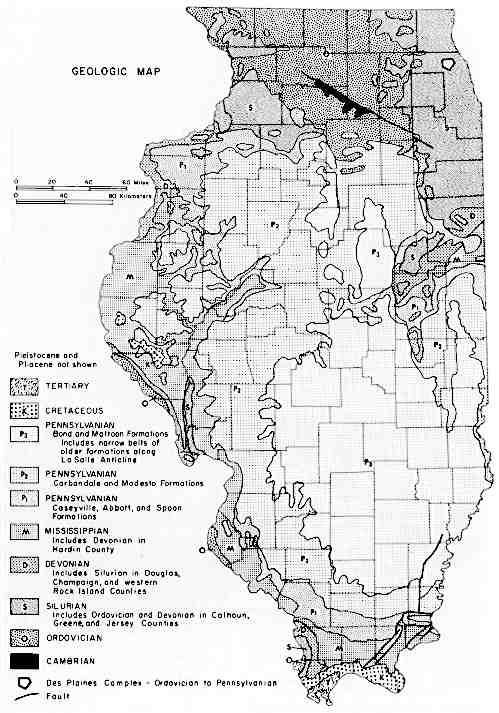 Willman suggests that the Chicago area reefs, including Thornton, may have been much thicker before erosion and that they are surrounded by muddier dolomites and the occasional green shale. After all this reading and driving over the Quarry on Interstate 80 a bunch of times, I was really interested to see inside one of the largest holes on Earth. So, when I heard about the Illinois Association of Environmental Professionals field trip led by led by Donald Mikulic and Joanne Kluessendorf, I signed right up. We toured Thornton in a school bus. I was overwhelmed by the 350 feet of rock; amazed by the variety of fossils and minerals we collected from the shot rock. It was also fascinating to hear some of the top geologists in the state arguing the fine points of Silurian reef formation. Three of my Trinity Christian College students on a detached block (left). Note the dip of the rock strata in the background behind the students. Donald Mikulic and Joanne Kluessendorf at the Quarry Overlook (right) during the AEG field trip. 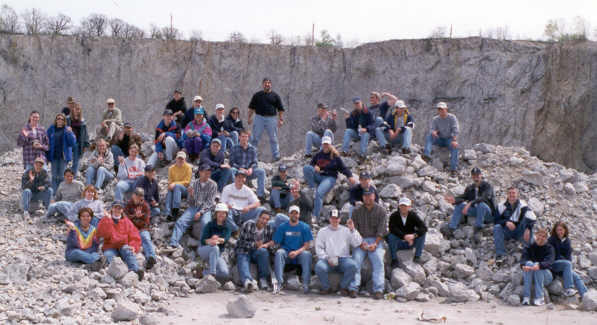 In Spring of 1999, I took a class of fifty Trinity Christian College students and a half a dozen Morton Arboretum students into the quarry. We were led by Lyndon Dean, geologist for Material Service Corporation (now retired). Lyndon showed us maps and air photos of how the quarry had grown over time and explained the formation of the reef, slowly but surely, from a small inner core into the nearly mile wide structure now being mined for gravel. The bottom bench of the quarry was about 325 feet deep. We did not get to see blasting; this day the quarry was crushing rock "shot" off the previous day. Then we went down into the quarry itself and drove through giant arches from section to section and examined the rocks in each part of the quarry. Lyndon explained that the arches were formed from the top down. When the top of the arch was at the floor of the quarry, they just drilled through. As the floor of the quarry has gone down and down over the years, the floor of each arch went down, too. Interstate 80 runs over Thornton Quarry. Notice how the rocks tilt upward from the lower left hand corner toward the 18-wheel truck on the bridge. The reef center was higher than the edges, detritus fell down the outer edges and was trapped by other organisms or the sea floor. This created a dome-like structure. As you drive across this bridge on I-80, you can see these opposing dips. The quarry has to be pumped dry because groundwater runs into the quarry through cracks in the perimeter walls. The northern pit is being deepened the fastest. When finished, it will be sealed off from the southern quarry. Then it will be used as a retention basin for the Metropolitan Sanitary District's Tunnel and Reservoir System, more popularly known as "Deep Tunnel." 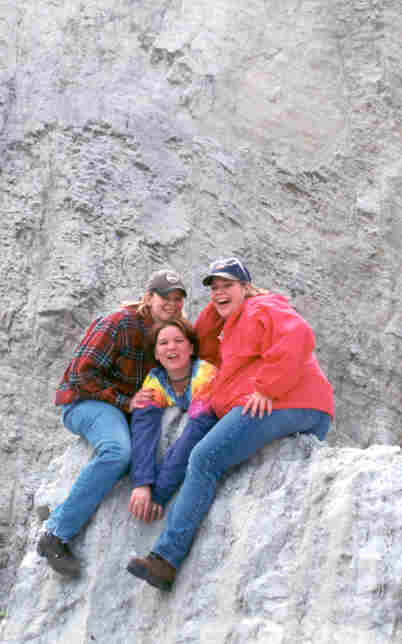 We're sitting on the pile of fossiliferous rock put there by Material Service for field trips like ours. You can also find Thornton Quarry rock along nearby railroad tracks and road edges as well as in blocks along the lake shore and viaducts in Chicago. Alden, William. 1902. Geologic Atlas of the United States, Chicago Folio. 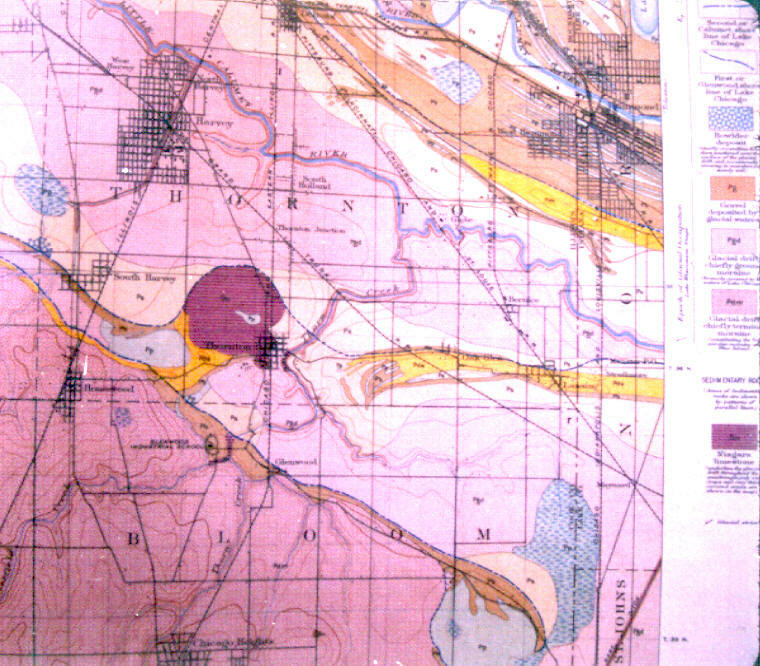 U.S. Geological Survey, Number 81. Bretz, J Harlen 1940. Geology of the Chicago Region - Part I Bulletin 65. Illinois State Geological Survey. Reprinted September 1964 without figure one (the map). Mikulic, Donald G. and Joanne Kluessendorf. 1985. Classic Silurian Reefs of the Chicago Area. 49th Annual Tri-State Field Conference Guidebook. Willman, H.B. 1971. Summary of the Geology of the Chicago Area. Illinois State Geological Survey, Urbana, IL. Circular 460. The plate is also available as a loose map and a laminated map from ISGS. Print out these pages of common Silurian fossils from Willman, et al. 1975. Illinois Geology - Useful Publications from various published sources which cover the whole state; some are technical. 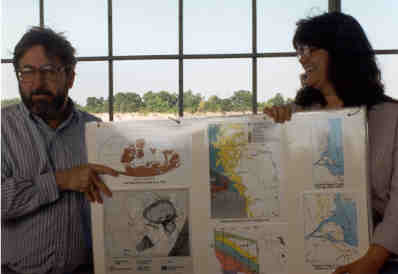 Illinois State Geological Survey - everything for Illinois Geology. Village of Thornton - more pictures, timeline and old photos of the quarry. History of Thornton Quarry from Northern Illinois University Library. Deep Tunnel Virtual Tour from the Metropolitan Water Reclamation District. Deep Tunnel Map This program is also called "TARP" meaning "Tunnel And Reservoir Program."